We’d love your help. Let us know what’s wrong with this preview of Mary Bennet by Kate Allan. To ask other readers questions about Mary Bennet, please sign up. Is there going to be a second book for Kitty's story? I loved this. A lot. It was simple and cute and sometimes you just need that in a book. I'm fascinated by the authors take on Mary. In Pride and Prejudice she's portrayed as being rather pious, but in this she has a more scientific mind. I actually ended up having a lot in common with her. It did have a lot of editing problems, but i can't bring myself to give it a lower rating as i loved it so much. Such a beautiful continuation to Pride and Prejudice focusing on the shy and demere Mary Bennett. I love classics. The language, the sweet and romantic way the men treated women. Everything about this novel was so well put together. A great portrayal of the times and how hard it was to tell a man you cared way back when. In this Pride and Prejudice sequel Mary and Catherine Bennet are invited/sent to Pemberley to acquire husbands. On their journey northwards, while staying at an inn, Mary meets early one morning a Mr Sharnbrook of Kent. This proves not to be an auspicious start to a relationship but they meet later at Pemberley. Can Mary overcome her faults to have a happy ending. An enjoyable easy to read tale of one of my favourite characters. A re-read of this Pride and Prejudice sequel where Mary and Catherine Bennet are invited/sent to Pemberley to acquire husbands. On their journey northwards, while staying at an inn, Mary meets, early one morning a Mr Sharnbrook of Kent. This proves not to be an auspicious start to a relationship but they meet later at Pemberley. Can Mary overcome her faults to have a happy ending. Still an enjoyable easy to read tale of one of my favourite characters. This was a very enjoyable book about Mary Bennet and I enjoyed how the author showed some scenes from the perspective of Mary as well as some from the perspective of Mr. Sharnbrook. I enjoyed this books main story although I would have liked an epilogue and to have found out what happened with Georgiana's possible romance as well as what happened with Kitty. I felt like her story just got forgotten and things never resolved themselves. Mary Bennet is a familiar, if somewhat neglected character, in Jane Austen’s classic Pride and Prejudice. Mary, the middle child of the five Bennet sisters, lacks the vivacity and beauty of Elizabeth and Jane and lacks the boy crazy flirtatiousness of Kitty and Lydia. Not surprisingly Mary fades into the background as readers are drawn to the fates of her sister. Kate Allan gives us the story of Mary, the much maligned middle sister, who for most of her life has been an embarrassment to her famil Mary Bennet is a familiar, if somewhat neglected character, in Jane Austen’s classic Pride and Prejudice. Mary, the middle child of the five Bennet sisters, lacks the vivacity and beauty of Elizabeth and Jane and lacks the boy crazy flirtatiousness of Kitty and Lydia. Not surprisingly Mary fades into the background as readers are drawn to the fates of her sister. Kate Allan gives us the story of Mary, the much maligned middle sister, who for most of her life has been an embarrassment to her family by her complete lack of social grace so important at the time. As a result Mary is often the source of ridicule by some of her siblings and, not surprisingly, her mother. At last, in Mary Bennet, Allan gives Mary center stage and a chance to develop in her own unique way. Allan does not rewrite Austen and I believe that the many fans of Pride and Prejudice will find that Allan remains true to the spirit and characters that Austen created. In this way, Ms. Allan provides an extension to Pride and Prejudice focusing on Mary, the sister that Austen introduced but did not fully explore. The characters that Austen crafted remain identifiable and true to their portrayal by Austen within Allan’s novel. Allan innovatively gives Mary an academic leaning and it is through research that she meets, collaborates and then come to love Nick Sharnbrook in her own time. Kate Allen lets Mary remain who she is and allows her to find acceptance and love from someone who appreciates her for herself. In the end she needn’t conform or master social grace to accomplish the near impossible, a love match. Mary Bennet is a wonderful accompaniment to Pride and Prejudice and will appreciate Kate Allan’s exploration of the life of Mary. 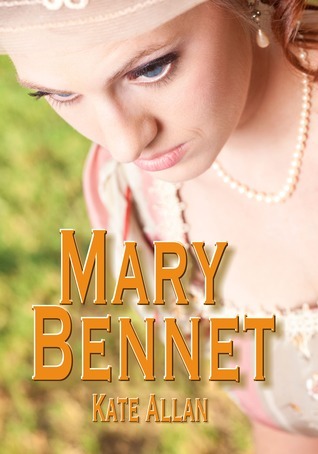 Mary Bennet is a true must read for anyone who enjoys the novels of Austen as well as those who enjoy the exploration of the life of women constrained by society and family expectations. Who doesn’t love the woman who defies the norm and finds contentment and fulfillment in a life of her own making? another good continuation. I really hope she does kitty's story, too. there was some editorial strangeness but nothing that distracted too much from the book. I liked this book. It was a bit like Mary: plain but insightful and sweet.